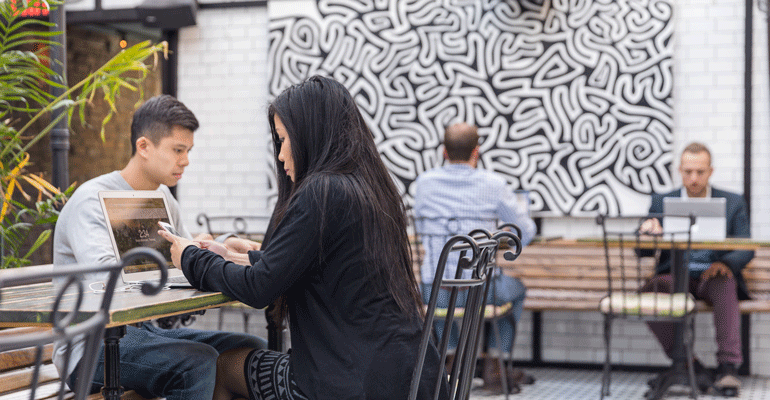 Coworking spaces are popping up everywhere. Is your restaurant next? 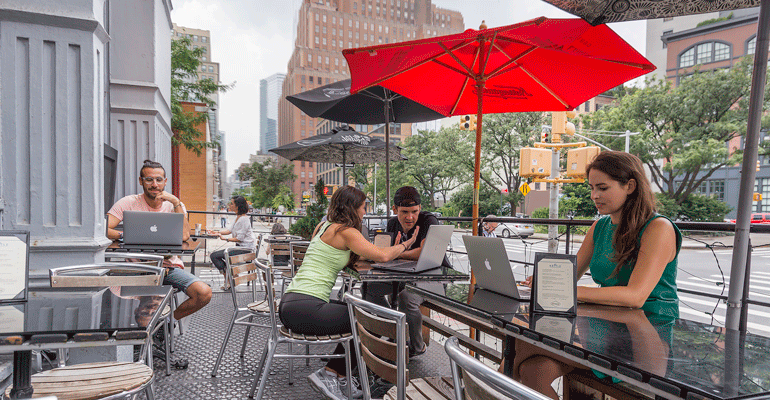 While some restaurants shun laptop use, others are embracing freelancers and remote workers. 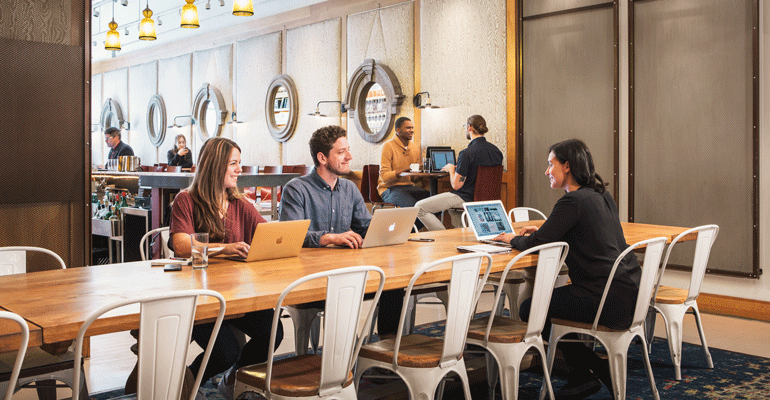 With help from startups like Spacious and Kettlespace, operators are transforming their dining rooms into coworking spaces for the 9-to-5 crowd and making a profit. “If you have the extra room, and you’re not operating that room at that hour, it’s a no-brainer,” said Kyle O’Brien, a partner at Hotel Chantelle, a three-floor restaurant, nightclub and event space in Manhattan’s Lower East Side. O’Brien has been working with Kettlespace to rent out part of his location to workers for about six months. A Kettlespace employee comes in every morning to set up extension cords, coffee and tea. Kettlespace members, who pay $25, $49, or $99 per month, filter in and out throughout the day. At 6 p.m., Hotel Chantelle becomes a typical restaurant again. Both Kettlespace and Spacious, a startup that offers a similar service to restaurants and coworkers, declined to give specifics on their financial arrangements with restaurants, saying each one differs, based on the size, hours and popularity of a space. “I wouldn’t say count it in your revenue model,” said Laura Maniec, a master sommelier and the co-founder of Corkbuzz restaurants and wine bars. She works with Spacious to rent out her venue in Manhattan’s Union Square to coworkers. But she calls the process “effortless” and has suggested working with Spacious to other restaurant owners. Restaurants sometimes have to close for private events or for a Food Network filming, for example, as CorkBuzz recently did. Spacious gives their members, who pay $99 a month for a year, a heads up about the closure. As a restaurant owner, Nick Iovacchini believes he has a unique understanding of fellow operators struggling with high rents. Iovacchini co-founded Kettlespace last year after operating his New York City-based gastropub, Distilled for five years. Andrew Levy, one of Iovacchini’s co-founders, came from Twitter. Daniel Rosenzweig, another co-founder, previously worked for WeWork, a leader in the coworking industry. Kettlespace currently operates in New York at eight large restaurants that focus on dinner service during the week. These restaurants often have high overhead and empty space during the morning hours. Kettlespace is actively looking to expand to other cities. All-day restaurants and those with a lunch program aren’t necessarily excluded from becoming coworking spaces. 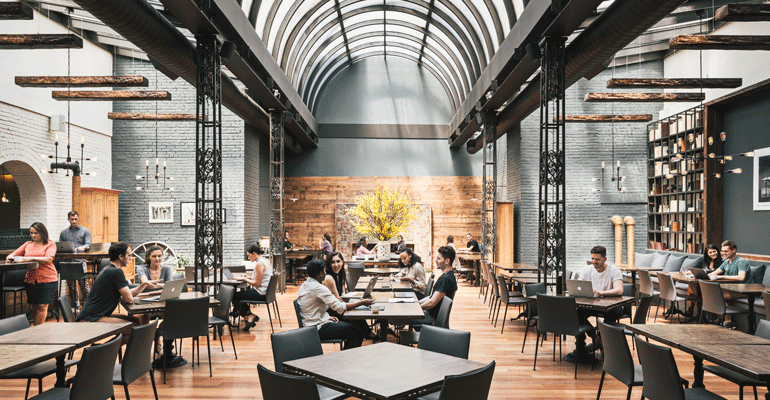 The Milling Room, one of Spacious’ coworking restaurants in New York City, recently started serving lunch. The Milling Room keeps their front room available to lunch guests and also serves Spacious coworkers at their seats in the back of the restaurant. “It’s much more convenient to sit here and order lunch than trying to figure out where to go,” Pesek said. Work Eat Play, another coworking restaurant startup in New York, is dedicated to restaurants that serve food all day. The startup is currently in the process of relaunching and fundraising, with the goal of expanding to Washington, D.C., Boston, Philadelphia and Austin, Texas. As co-founder and CEO Nicolai Strøm, describes it, the fundamental difference between Work Eat Play and its competitors is the ability to bring in foot traffic for breakfast and lunch service. Members pick a restaurant in which to work, and reserve a spot — much like they would with a reservation app. Throughout the day they have the option of ordering meals. “I’m a foodie, and I love a good lunch, and I typically built lunch around my workflow because I had the opportunity to work in a flexible way,” said Strøm. A previous version of this article incorrectly identified where Andrew Levy, a Kettlespace co-founder, previously worked and omitted the $99 price option available at Kettlespace.